Primary sclerosing cholangitis (PSC) is a chronic, immune mediated attack on the bile ducts of the liver causing inflammation and scarring. This leads to narrowing in the biliary tree inside and / or outside of the liver. PSC is a chronic, progressive condition which can lead to cirrhosis or liver / bile duct cancers. PSC is rare with a prevalence of 15 / 100,000 persons and most commonly presents in Caucasian males in their fourth and fifth decade of life. The median liver transplant free survival from the time of diagnosis is approximately 15 years. Up to seventy five percent of individuals with PSC will also have inflammatory bowel disease (IBD), more commonly ulcerative colitis. These patients are at increased risk for colon cancer and require yearly colonoscopy with biopsies. A primary bile duct cancer called, cholangiocarcinoma (CCA) may develop in up to 13% of patients with PSC with a substantial number of cases found within 2 years of the PSC diagnosis. Typical presenting symptoms include fatigue, itching and yellowing of the skin. Bouts of recurrent infections of the biliary tree are frequent and present with fever, right upper quadrant pain, nausea, and itching which can lead to sepsis. Episodes are caused by obstructions in the bile ducts from inflammation and scarring. In addition, PSC patients may develop fat-soluble vitamin (Vit A, D, E, K) deficiencies as well as fat droplets in their stool indicating malabsorption. They have increased risk of developing gallbladder and kidney stones, as well as thinning of the bones. In PSC, the blood tests present with an elevated alkaline phosphorous (AP) level that indicates cholestasis or slow bile flow out of the liver. Aminotransferase levels (AST and ALT) can range from mild to significant elevations, higher levels suggestive of overlap with autoimmune hepatitis (AIH). Serum bilirubin can be elevated in the later stages of disease or in obstructive episodes. Albumin, international normalized ratios (INR), and platelet counts are typically normal unless cirrhosis and portal hypertension have developed. The presence of pANCA and/or hypergammaglubulinemia (IgM) is helpful but not diagnostic of PSC. The diagnosis of PSC can be made by radiology tests such as a specific MRI that highlights the biliary tree. Magnetic resonance cholangiography (MRC) is a very helpful, noninvasive imaging modality of the biliary tree and is frequently used as the diagnostic test of choice over endoscopic retrograde cholangiography (ERC). If beading is noted on imaging studies and labs are consistent, the diagnosis is made. A liver biopsy is not always required and may not show features of PSC; however, if liver biopsy reveals typical features of PSC in the setting of normal radiology tests a type of PSC called small-duct PSC may be present. Currently there is no cure for PSC. Despite being an immune mediated condition, immune suppressive therapy has not been effective unless PSC-AIH overlap is present. The goal of management therefore, is slowing progression of the disease by decreasing the risk factors and controlling symptoms. Ursodeoxycholic acid (UDCA) has been extensively studied with variable results. For this reason, doctors tailor the treatment regimen and there is no official FDA approved therapy at this time. While UDCA cannot be uniformly recommended, there may be some populations that have benefit however further studies are needed. 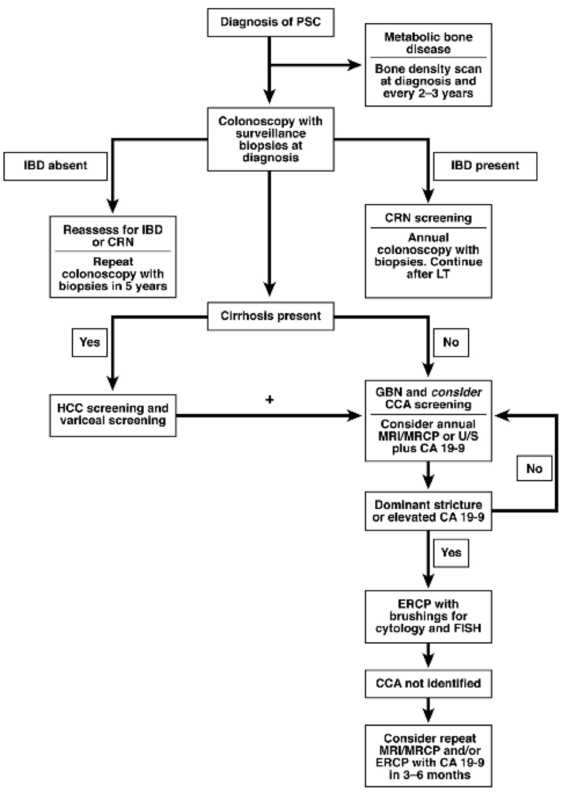 PSC patients are commonly screened with regular physical examination, US, and a serum CA 19-9 level. In PSC patients without cirrhosis this is frequently performed yearly. Patients with cirrhosis should be assessed every 6 months. When advanced disease develops, liver transplantation is the standard of care in eligible patients and consideration should be made for either cadaveric or living donor transplantation. Currently, patients with advanced PSC undergoing liver transplantation can expect a 1 and 5-year survival rate of 90-97% and 85-88%, respectively. There is an approximately 30% disease recurrence and possibly a higher chance in living related donors. To minimize long-term complications of recurrence and CCA, PSC transplant recipients typically have a biliary diversion (Roux en Y choledochojejunostomy).